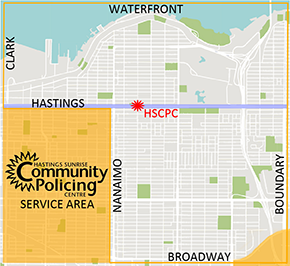 At Hastings Sunrise Community Policing Centre (HSCPC), protecting your personal information is one of our highest priorities. Any personal information you provide to the HSCPC is collected, used and disclosed in accordance to the Personal Information Protection Act (PIPA). Learn more about the Personal Information Protection Act at the Office of the Information and Privacy Commissioner for British Columbia. The HSCPC does not automatically gather any personal information from you, such as your name, phone number, street or e-mail address. This information is only obtained if you provide it voluntary, for receiving our newsletter, volunteer application, membership, or reporting a complaint/ concern. This website contains links to other sites. Please be aware that the HSCPC is not responsible for the privacy practices of such other sites. We encourage our users to be aware when they leave our site and to read the privacy statements of each and every website that collects personally identifiable information. This privacy statement applies solely to information collected by this website.